Perfect blender for blending child sized portions. Two speed settings for different textures. Easy to clean - container and blade suitable for use in dishwasher. Pulse action. Lid safety lock. Non slip rubber feet.Every moment you spend with your baby is precious, so hours spent preparing meals and cleaning up may not be high on your list. 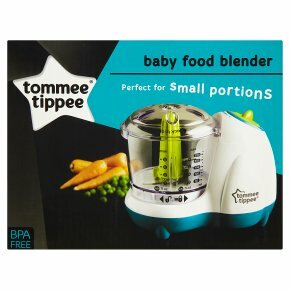 Our Tommee Tippee Electric Food Blender helps you whizz up the perfect meal for your little food critic. Handy hints and tips for worry-free weaning<br>Don't be upset if they don't like things. Babies like foods that are familiar. You may need to offer a new food ten times before your baby will like it, so don't force matters, just wait until next time.<br>Say not to salt, sugar and stock cubes. Try not to add these to food or cooking water - they simply don't need it! If you're cooking for the whole family, you may want to take out their portion first before adding extras.<br>Letting your little one feed themselves is great for their development, but give yourself a break! Try placing a plastic mat under their high chair, use a bib that catches crumbs and consider a cup with a non-spill valve.